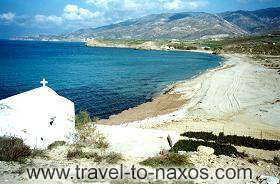 The beach of Ammitis lies at the north part of Naxos, 10 km from the Town. It is a secluded beach, ideal for those wanting to relax and enjoy their swim away from the crowds. There are very few traditional taverns and lodgings. You can easily reach the beach through a roadway, passing by Galini and Eggares villages.